For a limited time, the 98.4” wide Mimaki JFX200 UV printers come with not only a $2,000 to $3,000 instant rebate, but also a free set of Mimaki LH or LUS inks (8 x 1000cc) and, for the JFX200-2531, a free 2-year extended warranty —a $10,000 value. These multi-head printers have a resolution up to 1,440 dpi, capable of high quality printing at eight 4’x8’ tables per hour. The JFX200 prints to both flexible media, such as banners and print packaging, and rigid materials, such as wood, aluminum, or glass. Applications includes signs & displays, POS display, object decoration, industrial print and packaging. Raster Link 6 RIP included. Our friends at Moab are offering free passes to PhotoPlus Expo 2017. You can visit them at booth 451. 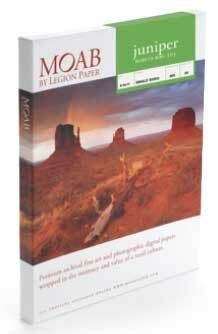 ImageTech has the lowest prices on Moab fine art media. Through Bayinkjet, our online store, we sell large format ink and papers worldwide. Media and ink orders from Imagetech and Bayinkjet often ship for free. 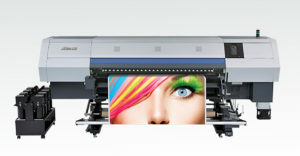 We are experts in wide-format printers and authorized dealers for Canon and Mimaki, specializing in sales, installation, service, and repair to the Northern California market. Don’t hesitate to call us for details on the latest deals on printers, as well as your fine art large format printing questions. Until December 22, 2017, the Mimaki UJV55-320 printer comes with a free 2-year extended warranty, a $7,000 value. This multi-head, dual-roll 10′ printer is fast, printing at a resolution of 1,440 DPI at speeds of 605 SqFt/hr. Applications include signs & displays, window graphics, banners, posters, flags, vehicle wraps, wallpaper, sports apparel, interior design, stickers, decals, labels, fine art, and POS display. Compatible with Mimaki LUS 120 inks (sold separately). Raster Link 6 RIP included. Available now on ImageTech’s Bayinkjet online store are the Moab Flint Portfolios for photography and artwork presentations. These ultra-modern screwpost portfolio folders easily convert your images into a stunning presentation for editions, wedding albums, design books and digital scrap-booking. 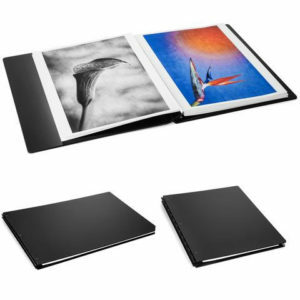 The elegant, matte-black acrylic exterior is scratch and fingerprint-resistant, providing a neutral protective cover for your prints. The innovative adhesive hinge strips can be applied to any Moab paper, allowing you to utilize the full range of Moab. A package of 25 hinge strips are included with each portfolio. Call us with any questions you may have about Moab Flint Portfolios. 510.238.8905. 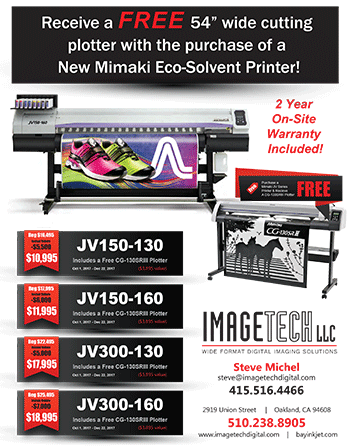 For a limited time the Mimaki JV150/300 solvent and eco-solvent printers come with not only a $5,000 to $7,000 instant rebate and a 2-year on-site warranty, but also a FREE Mimaki CG-130SRIII plotter valued at $3,895!. These single head printers have a resolution up to 1,440 dpi and speeds from 605-1,140 SqFt/hr. Ideal for sign and graphics shops, applications include sublimation (for cups, plates, promotional items, etc), signs & displays, window graphics, banners, posters, flags, vehicle wraps, wallpaper, sports apparel, interior design, stickers, decals, labels, fine art, and POS display. Compatible with Mimaki SS21 or ES3 inks (Ink sold separately on JV300 models). Raster Link 6 RIP included. ImageTech is a full-service authorized Mimaki dealer, specializing in sales, service, and installation. Visit Bayinkjet to view our large format printer inks and supplies. Offer expires 12.22.2017. Delivery, installation, and training not included. ImageTech not only sells Mimaki ink but also specializes in Mimaki printer sales, installation, and repair. We know your printer inside and out and are in this for the long term. So not only can we sell you authorized Mimaki inks at the best prices, we will also set you up with the best media to go with it, support you when something goes wrong, and answer all your questions. Call for more information and if you find someone else with better prices, we’ll do our best to match them. Telephone: 510.238.8905. Solvent ink has excellent weatherability and rub-fastness. The standard ink for beautiful indoor and outdoor signage. Latex ink is an eco-conscious ink that contributes to a reduced effect on health and improvement in the work environment. Water-based pigment ink produces bright colors and has lightfastness. UV-Curable ink is cured and adhered to the media or substrate by UV radiation. Sublimation ink dramatically improves print quality on polyester. Acid-Dye ink is for novel and unique image designs printable on wool, leather, silk, and nylon. Reactive-Dye ink enables printing on cotton, hemp, silk, rayon, and some kinds of polyester. Textile Pigment inks contain a binder and a binding agent, which fix the color to the fibers on heating, and print fabrics. Disperse-Dye inks are fixed by heating and have high durability.